i’ve been debating making granola on the stovetop for a while. first heard about it last year, but trying to make it in a dorm kitchen wasn’t very appealing. and then i was irrationally chicken because none of the granola recipes i wanted to make were stovetop. finally sucked it up because i got too curious not to try this technique, and did it with this pecan, cherry and coconut granola. about the stovetop method (i’ll go more in depth below in the recipe): it is more active time, because you have to frequently stir the pot so that the stuff on the bottom doesn’t burn while the things on the top stay pale (kind of like reverse tanning if that makes any sense). i toasted oats, then nuts, then seeds, then coconut. i did it altogether, but i’d suggest doing them separately for further control. add the flavorings and sweeteners and fat, stir, and cool. mix in fruit if desired. that’s it! i loved all the different things in this pecan, cherry and coconut granola, even if it was a little too sweet for me (i’d go 1/4 cup each sweetener next time). my mom thinks the granola is more heurng (a chinese term; i define it as being flavorful from well browning/caramelization, though my definition might be off slightly. correct me if you can define it better!) this way, and i agree. Oven Method: Mix the dry ingredients together, followed by the wet ingredients and spices. Spread on a sheet pan and bake at 300F for 45 minutes, stirring every 15 minutes, until crunchy and golden brown. Mix in the fruit. Cool completely before storing. Toast the first five ingredients. I’d suggest doing them all separately to ensure that you get them all to their perfect toastiness. Or you can just toast them in one pot without removing anything, but stagger the times; I used the order above, because I thought the oats would take the longest and the coconut the shortest. Once everything is toasted to your desired doneness, add the first five ingredients back to the pot (if you took them out). Make a bit of space (I did it near the side of the pot, but you can make a well in the middle if you want). Add the sugar, syrup and oil to that spot; let the sugar melt. Mix the wet ingredients into the dry ingredients. Add the salt, cinnamon and nutmeg slowly. I like to sprinkle a little bit on top, mix it in, and repeat. You can just dump it in, but I tend to have bad luck and it clumps together in a spice bomb for me. I used to think it was necessary to spread the granola out on a sheet pan to cool, but it’s not, at least for small/medium batches. If you have a huge batch and it’s in a deep pot, I’d still recommend spreading it out (at least you don’t have to turn on your oven!). 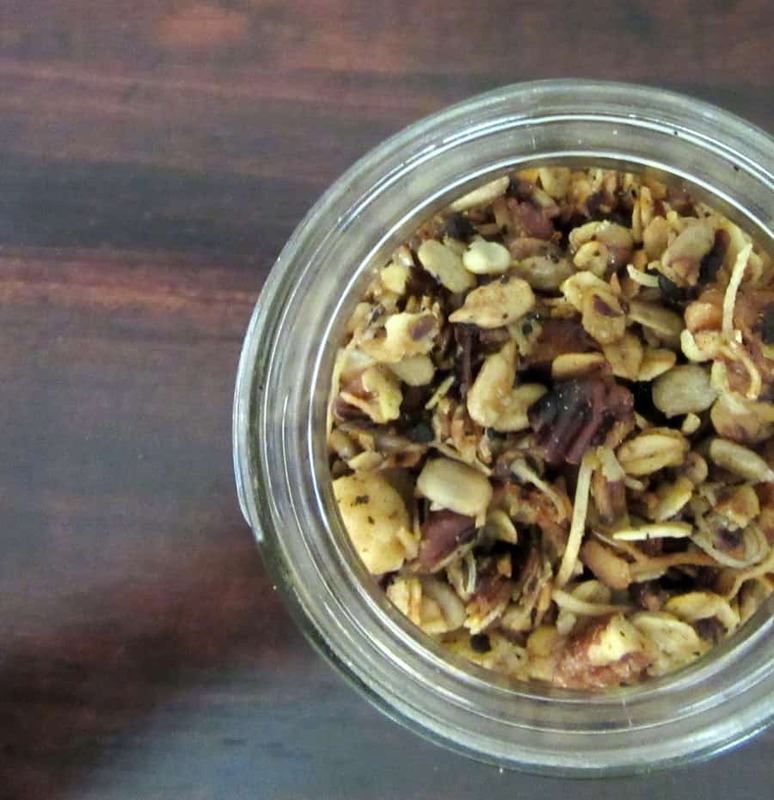 Don’t worry if the granola is still soft at this point; it will crisp and harden as it cools. Stir in the fruit and store in an airtight container at room temperature. Looks good Heather 🙂 I am making it sometime next month but the question is my friend ,which way is better as for taste purposes . I would assume you prefer the stove top because of your lengthy instructions but only you know and I would like you to tell me please! thanks peter! i included long instructions just in case someone needed to know exactly what to do (: i think making it in an oven is easier because you don’t need to watch over it as much, but stovetop is definitely faster. if need a small batch, i go with stovetop, but if i’m making a large batch, it’s really hard to get everything evenly cooked, so i use the oven. hope that helps! Oh Iam sorry Heather one more question. How long do you cook it after everything is mixed on stovetop. isn’t ironic you wanted to be thorough with your instructions but somehow you skipped the time 🙂 Which way does it better. no problem, peter! it depends on the ingredient; oats take longer to toast than coconut does, and if you use already roasted nuts (ie i usually have a jar of roasted walnuts hanging around), then you don’t really need to toast them. i’d start with 5 minutes for the coconut, and 10-15 for the oats, nuts and seeds over medium-low heat, and then toast more if necessary.